The Romance Dish: The Search Is Over! I've enjoyed all the books I've read by the great Nora, but I must say my favorites so far on this glom have been her single title stand-alones. I absolutely loved THE WITNESS and NORTHERN LIGHTS and really enjoyed WHISKEY BEACH. Her stand-alones tend to be longer than her series single titles and often have a strong mystery/suspense plot. They also include a rich cast of secondary characters. 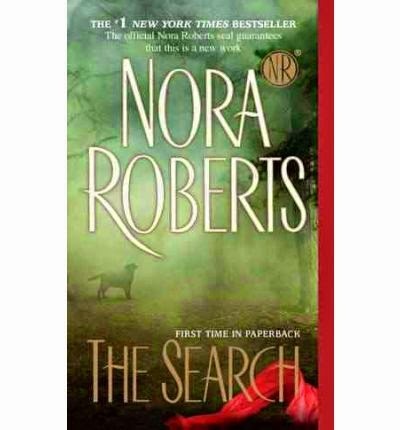 Another to add to this wonderful list of Nora Roberts favorites is THE SEARCH which I picked up thanks to some recommendations for further reads on that Romance Bandits post. I devoured this one pretty much in one sitting - a bit like the way the dogs, who are such wonderful characters in their own right in the story, wolf down their dinner! THE SEARCH was published in 2010 and is set on a fictional island in Puget Sound off Seattle. By the way, one of the things I absolutely love about NR's books is the way she writes about places. The setting is always such a vivid part of the story and rainy, isolated Orcas Island is no different. The heroine Fiona Bristow has come to this wild and beautiful place to set up business as a dog trainer and to escape the horrors inflicted upon her by the Red Scarf Killer. It's taken her years, but Fiona has finally found some peace after all the pain and tragedy, in working with the dogs and playing an important role in a search and rescue team.There's even the possibility of romance with laconic furniture designer Simon Doyle who needs help with his delightful puppy Jaws (cute, huh?). But the Red Scarf Killer hasn't forgotten that Fiona is the only woman to escape him and while he languishes in prison, he hatches a brilliant but cruel plan to use an apprentice to finish off this woman whose mere existence challenges his evil ego. Even as Fiona falls under the spell of the first man to touch her heart since the Red Scarf Killer murdered her policeman fiance, danger looms closer and closer and threatens to steal not only her happiness but her very life. While the suspense plot of this one is really edge of your seat, it's the characters that make the book special. Fiona has been to hell and back and as a result, she's strong, she doesn't put up with any time wasters, and she goes after what she wants. This is a heroine who is perfectly capable of rescuing herself (even as a young woman when the RS Killer kidnaps her). She has a strong moral compass and a guarded but deeply loving heart that until she meets Simon, she mainly devotes to her canine charges. Simon is a wonderful creation - such a bloke! He doesn't talk when he doesn't feel like it, he's focused on his work, he definitely doesn't want to fall in love. But he meets Fiona and he's a goner. Always lovely to see the strong, silent type struggling with feelings that he doesn't welcome for one minute but which he can't escape. And Simon's a man who when he commits, REALLY commits. Watching the relationship between these two strong, independent souls as it grows and blossoms is a really emotional experience. For me, the love story was the heart of THE SEARCH. So if you're looking for a great read that's likely to keep you turning the pages into the wee small hours - not to mention the chance to meet some great people and some seriously appealing pooches - I'd recommend THE SEARCH. Are you a romantic suspense reader? Do you have any recommendations? Christina Dodd has a new suspense novel out called Virtue Falls. I loved it! If you haven't read Roxanne St Claire's Bullet Catchers series, I highly recommend them. Thanks for the recommendations, PJ. And huge apologies for being so late to respond. My brain is like Swiss Cheese at the moment - I"m selling the house and trying to keep everything else going and I completely forgot I had a review up here this week! Silly moi! Mercy - Julie Garwood & Dirty Little Secrets by Liliana Hart - more of a suspense type not romance. Thanks, Patoct. I'll check them out! Laura Griffin's Tracers series is great. She and Allison Brennan have co-written two books in their Moreno & Hart Mysteries that are unique and addictive! Those books are Crash & Burn and Hit & Run. LSU, those sound very interesting. I find the whole writing team thing absolutely fascinating. I"m too much of a control freak to do it so I admire those who do! Thanks for the recommendations. JCP, you're not the first person to recommend Karen Rose to me. I really must get one of her books and give her a whirl. The people who read them just love them! Add Linda Howard to the list too. I've only read some of Nora's stand alones so far myself and enjoyed them. I've collected quite a few others of hers but I really try collecting the series first which I've not done as yet. Catslady, I'm a long-term Linda Howard fan. I regularly re-read my faves of hers like Son of the Morning or Now You See her. I think she does the romance just so beautifully in her stories - and she can really write great men! Anna, I also love this book. The meeting of Fiona and Simon was laugh-out-loud funny despite the overall grim plot. I do enjoy romantic suspense. Cindy Gerard's Black Ops, Inc., Dee Davis's A-TAC, and Dianna Love's Slye Temp series are favorites there. I love Karen Rose's books, though they edge more toward mainstream, to me, than RS. You've already blogged about Nora's Northern Lights. I enjoyed her High Noon, about the hostage negotiator, and Angels Fall, about a writer and a chef who survived a robbery/murder. It has kind of a gaslight twist to it. In the suspense-with-romance vein are Karin Slaughter's Will Trent series and Linda Castillo's Kate Burkholder mysteries. Both have continuing romantic subplots. Slaughter took a break from Will Trent this year to write something different, and I'm seriously antsy for the next in the WT line. Nancy, actually you were the person who put me onto the Search (and Catching Fire which is the next off my Nora shelf). Loved it! Thank you. Oh, more recommendations. I'll order both of those. I love Cindy GErard's books - she was a very popular guest over here for the Australian Romance Readers Association convention a few years ago. She has a wicked sense of humour! I've read one of the Kate Burkholder books and loved it - must get more. Thanks for the other recommendations. I must say I like a bit of romance mixed up with my suspense. I read mysteries and suspense before I read romance and the two together make a combination I enjoy. Suzanne Brockmann's TROUBLESHOOTERS Seal Team series has strong characters and tense plot lines. I have enjoyed Julie Garwood's FBI series also. I have read many of Nora Roberts' books, but not the ones you mentioned. She is such a prolific writer, I can't keep up with her. THE SEARCH is one I will be looking for. Linda Fairstein, as well as Lisa Gardner and Iris Johansen have stories the lean heavily on the suspense. I am working my way through the Julie Spencer-Fleming Clare Fergusson and Russ Van Alstyne Mysteries. A favorite since they take place in the area where I grew up. Finally, an author I really enjoy is Kathy Reich and her Temperance Brennan novels. There are so many good authors, I hate to leave any out. Hi Pat! Thanks for the recommendations. I've discovered so many great books through the Romance Dishes. Including the Julia Spencer-Fleming books. I think she's just brilliant - only recently read the latest one, as good as ever. And I love Claire and Russ's relationship and how it develops. I've read a few of the other authors you mention, Kathy Reich and Julie Garwood (but only her romances) and Suzanne Brockmann but not for a while. I must chase them up!